Move In Ready! 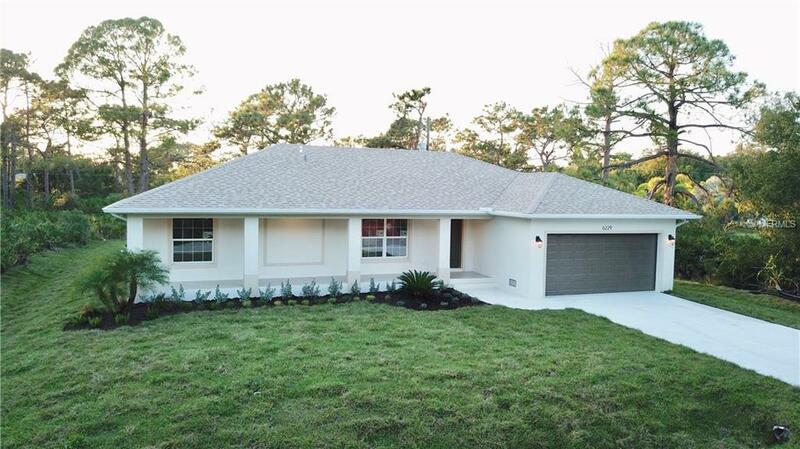 This "Hanover" Model features three bed, two bath, two car garage POOL-home features a spacious split floor plan, sturdy concrete block construction, all hip roof, architectural shingles, and a covered front veranda that spans the full length of the home. As you enter through the front door you will find an open concept living space with vaulted ceilings and durable porcelain tile throughout. The kitchen boasts GRANITE countertops, stainless steal appliances, large corner pantry and breakfast bar, All wood & Soft close cabinets. The master suite features dual sinks, large shower and spacious walk in closet. Bathroom two provides a shower and tub combination and is perfectly located between the two secondary bedrooms and is convenient to guests as well. Off the great room through the back sliding glass doors, step out to your piece of paradise! The Hanover comes standard with a 20 x 44 foot PAVER pool deck with a SCREENED lanai enclosure. The Hanover's 21x12 foot concrete pool features a top of the line Pebble-Tec finish. The yard is beautifully landscaped and fully irrigated with rain-bird system. This home is situated on a quiet street in East Englewood, within minutes of beaches, shopping, restaurants, and great fishing. If you have been looking for an affordable home where you too can live the Florida pool-home lifestyle look no further! The Hanover is the best value new construction pool-home in southwest Florida.